The New Pro-face Standard | A.K.MECHATRONICS CO.,LTD. 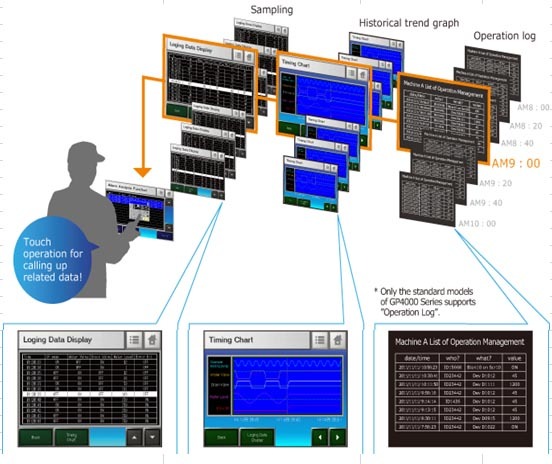 When errors occur, operators can now minimize lost time by checking error-related data in order of occurrence. Simply touch the alarm message during an error to quickly track down the cause and perform an on-site recovery. Ethernet I/F is now provided as a standard feature. 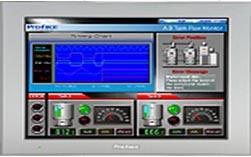 The GP-Viewer EX software provides various remote monitoring functions, such as checking the screen of the GP located on a production site from a remote office. Production loss can be minimized. just by touching the alarm message to call up various error-related data in chronological order.